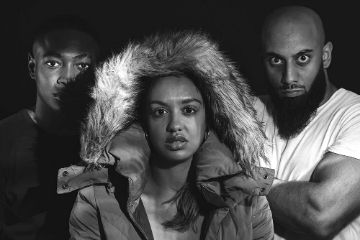 In the year that has seen knife crime in the UK soar to an unprecedented level, writer and actress Ambreen Razia, presents POT, which goes inside the corrupt and violent world of inner city gang culture. POT delves into the lives of Britain's invisible children, adrift in the care system and inadvertently impacted by gang culture. Sixteen-year-old Louisa wakes up in a flat on her estate with her erratic and unstable boyfriend Josh missing and a notorious drug dealer on her back. A young man, Miles, who is clearly concealing his own troubled past has been appointed her protector. Time is running out as Louisa must decide whether to do the right thing whilst a series of revelations suggest everything is not as it seems. "POT is a raw tale set in inner-city London and it pulls no punches. "It raises questions about why young people who leave care, form families on the streets. "I want to capture these stories which go untold, the voices which echo from the underbelly of our cities; nobody should be exempt from seeing themselves reflected back at them. "I believe that through theatre we can help tell stories which centre around young people who are unheard, mis-represented or exploited, enabling us to break down misconceptions and dismantle damaging stereotypes." POT is a follow-up to Razia's Diary of a Hounslow Girl - the term 'Hounslow Girl' has become a byword for confident, young Muslim women who are grappling with traditional values, city life and fashion. From the joys of Pakistani weddings to fights on the night bus, the play is highlights the challenges of being a teenage girl in a traditional Muslim family, alongside the temptations and influences of growing up in and around London. POT, written by Ambreen Razia and directed by Sophie Moniram, will be at Dorothy Stringer School, Brighton, on 4th October 2018. For tickets and info CLICK HERE.